If your computer supports it, Web Bluetooth is the easiest way to get started with Espruino. Get a Bluetooth 4.0 (or later) adaptor (they cost ~$10) - see the requirements section above. Windows 10 fully supports Web Bluetooth, as long as you have an up to date version of Google Chrome (v70 or above) and your PC has a Bluetooth LE radio (all new Laptops will). 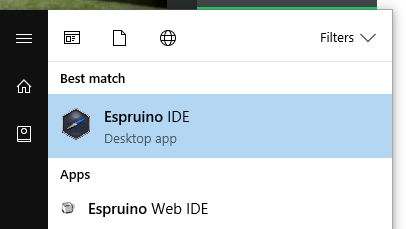 If you do not have Windows 10, you need to install the Espruino Native IDE application instead, as this is able to access the Bluetooth adaptor directly. You need to enable Experimental Web Platform Features (chrome://flags/#enable-experimental-web-platform-features). All Chromebooks with Bluetooth should support Web Bluetooth. Android 6 (Marshmallow) or later are supported out of the box. Android 5 (Lollipop) devices can use Chromium installed over ADB to a developer mode device. Go to the Puck.js site. It should tell you that you have Web Bluetooth. Click the Web IDE option. Wait a few seconds - you should now be connected! You can now try writing some code! On some platforms (Windows, or Linux with older versions of Bluez) Web Bluetooth isn't supported yet. On these you'll need to install a native application. We've created a Web IDE installer for Windows - don't use the Chrome Web Store version at the top of that page, as it won't give you access to Bluetooth devices. Once installed, you need to run Espruino IDE - which is confusingly similar to the Espruino Web IDE which you may have had installed if you'd used normal Espruino USB devices before. Bluetooth LE Serial devices (Nordic UART Service) like Espruino are not treated as serial port devices by Windows. If the IDE's connection menu shows devices beginning with the word COM (eg. COM5), they are not your device and connecting to them won't work. If you're using a Bluetooth dongle with Windows 10 you should use Windows' built-in Bluetooth software, rather than installing the software that came with your Bluetooth Dongle. Often the Bluetooth dongle's software will not pair with Bluetooth LE devices and expose them via Windows 10's API. Once set up, you can try writing some code! There are two ways of using the Raspberry Pi to control Espruino devices. Or you can use the Raspberry Pi to host a web-based version of the Web IDE. In the worst case, you don't have any computers that allow you to communicate using Bluetooth Low Energy. 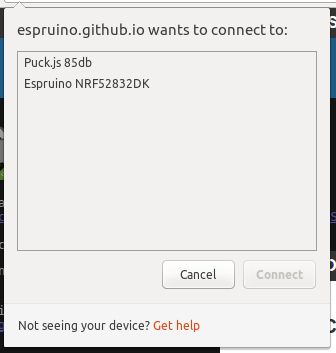 To connect, try espruino --list to list devices, then copy your device's MAC address and type espruino -p aa:bb:cc:dd:ee to connect. Press Ctrl-C twice to exit. You can now start writing some code! Type commands into the console - see Commands below. Note: In this app, you need to manually press the Enter key before sending a line. If you're on iOS you need to do this by copy/pasting out of code in notepad - which is much trickier (the Adafruit app above is easier). You can use Web Bluetooth on your own website to control Espruino BLE devices, as long as you have a compatible browser. You can make your own application to control Espruino for whatever platform you need. For the simplest control, all you need to do is connect to the Espruino bluetooth device and the characteristic with ID 6e400002b5a3f393e0a9e50e24dcca9e. You can then write repeatedly to it to send commands to Espruino. Type in LED1.set() and click send. The red LED should light up. Note: Espruino runs on many other devices, and espruino.com caters for all of them. Unless a tutorial explicitly says it is for your device it's possible that you will have to change some pin names and wiring to match the pins that you used on your device. As a result, if you've been using your device but don't intend to use the code you've uploaded it's recommended that you either remove the battery, or connect to your device and type reset(), to ensure that no code is running in the background that might flatten the battery.